My #1 way of staying warm while living in my van is to go somewhere warmer when the weather gets colder. For example, in 2014, I left Northern New Mexico at the end of October and went to Southern New Mexico, where I stayed for November and December. In January 2015, I went to Arizona and stayed in various places in that state until I went to the California mountains at the end of April. People often ask me if I stay warm enough in the van at night. Staying warm at night is not a problem. My bed is raised about two feet, so my body heat isn’t lost to the floor, and I have storage space. I sleep on two layers of memory foam, which is notorious for making people hot. I wear long underwear and socks to sleep when I need to, as well as a hat if it’s particularly cold. I have plenty of blankets, including two sleeping bags and a knitted (crocheted?) blanket stored flat under the memory foam and on hand for any really cold situation. My bed lies across the back of the van, up against the back doors. On the side opposite the back doors, I have a curtain (a sheet I paid $1 for at a thrift store strung on a bungee cord) that I can pull for privacy. I found out early on that the curtain holds in quite a bit of my body heat. In hot weather, I often have to leave the curtain open at night so I don’t get warmly uncomfortable. When it’s cold out, I’m glad the curtain holds in the warmth. Once I’m in bed, I’m warm. Sometimes I even get too warm and have to push the covers down for a while so I can cool off in the chilly air. The problem in cold weather is getting out of the bed, either to get dressed and get out of the van or to move around inside the van (to tidy up or to cook, for example). Sometimes it’s too cold inside even to sit up in bed to read or write. While I was in Southern New Mexico, temperatures were getting down in the low 30s at night. I researched how other rubber tramps stay warm in their vehicles. One idea I found on a couple of websites was burning a candle. Candles (supposedly) raise interior temperature in a vehicle by 10 degrees. Of course, one must be careful with the open flame. (I have a lot of fabric in my van—curtains, rugs, blankets, clothing strewn about—so I have to be particularly careful not to catch everything I own on fire.) One must also be careful not to let the candle use up all the oxygen in one’s enclosed space, which can lead to death. This means one must leave a window open at least a crack when using a candle inside a vehicle. I wondered if leaving the window open—even just a crack—negated any heat produced by a lit candle. However, I was willing to give it a try, so I walked down to one of the locally owned gift shops and bought a small (overpriced, artificially scented) candle. I tried burning the candle a couple of mornings. I (thankfully) did not catch anything on fire, but I didn’t notice feeling any warmer when the candle was burning. I decided the candle experiment was a failure. At the time, I was staying in an RV park with electrical hookups. I considered going to Stuff-Mart and buying a small electric heater. (I think they run $15-$20.) I decided not to do that because I very seldom stay in my van in places with electrical hookups. Even a small heater would take up precious storage space when not in use, and I wouldn’t use it enough to justify having it. The last week I was in Southern New Mexico (the week between Christmas and New Year’s Eve), the temperature dropped to 28 degrees. I was lucky because I had gotten a house and pet sitting job. I stayed in a lovely warm house with a nice cat and a nice dog, and I didn’t have to think about heating the van. During my internet research, I’d read a bit about portable propane heaters. Several van dwellers I read about swore by them. I didn’t rush out to buy one because #1 they’re a little pricey and #2 burning propane in the van causes the same concerns as burning candles. At the Rubber Tramp Rendezvous (RTR), I talked to people who used propane heaters in their vehicles. The Divine Miss M had a Mr. Heater brand Portable Buddy heater, which was a popular choice among folks at the RTR. (I don’t know why exactly, maybe I heard someone else refer to the heaters this way, but I call this type of heater Mr. Buddy.) Miss M loved hers, said it got her station wagon plenty warm, but did stress the absolute necessity of leaving a window open a crack when using the heater inside. She assured me that the heater produced enough heat to overcome the cold let in through the partially open window. I stored the info in my brain file for future reference. I wasn’t in the market for a heater, although on some chilly mornings in the Arizona desert, I would have welcomed a few minutes of concentrated warmth. At one of the very last group gatherings at the RTR, during announcements, a man said he had a brand new Mr. 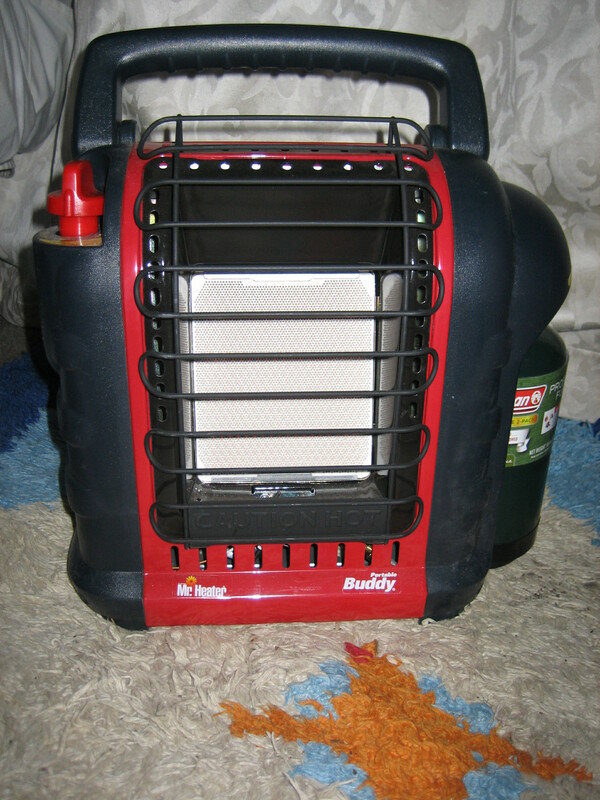 Buddy heater for sale. He said he’d just bought it from Amazon.com for $69 ($20 less than normal price, I was told) but had found a heater he liked better at the Big Tent. He wanted to sell the heater for $69, plus another $20 or $30 for the supplies to hook it up to a large propane tank. When I went to talk to the guy selling the heater and told him I was interested in the heater but not the accessories because I didn’t have a large propane tank, there was a grumpy old man already looking at the items. The old man snapped at me that I needed a larger propane tank because it was cheaper to buy propane that way. Rather than snap back at the old coot elder, I just told the guy with the items for sale that the old guy could buy it since he was there first. Before I could get back to my van, the seller had come after me to say the old guy didn’t want the heater and I could have it for the $69 he’d spend on it. I bought it. I tried it out a couple of times before I left the RTR (thanks to the bottle of propane Miss M gave me to use with it). It worked great, warmed the van quickly. It was just enough heat to get me motivated to get out of bed and get dressed. I told Miss M that Mr. Buddy was my new boyfriend! It’s cold in the California mountains, even in May. Seems like the temperature starts dropping around 4:30 in the afternoon (16:30, military time) and doesn’t warm up again until the next day around noon. Sleeping is fine. Actually, I sleep better when it’s chilly and I can snuggle under piles of blankets, so sleeping is excellent. It’s the between times that are trying. I get up early to do a check of the campground, sweep the restrooms, make sure there’s enough toilet paper. I decided I needed the warm motivation only Mr. Buddy can provide, so I’d already planned to unpack him when I heard the high the next day was expected to be only 41 degrees, and there was a possibility of snow. I pulled Mr. Buddy and his propane bottle out of the plastic crate and fired him up before I crawled into bed. In about ten minutes, the van was toasty. When I got up in the morning to pee, I fired him up again until I warmed up. Oh yes, Mr. Buddy and I are sure to have a long and happy relationship. I took this photo of my boyfriend, Mr. Buddy, in my van. The propane bottle fits right in on the side. #1 I open at least one window at least a crack before igniting Mr. Buddy’s flame. #2 Because there is an actual flame, I make sure no fabric is near Mr. Buddy’s front. #3 I never leave him unattended. I DO NOT exit the van or go to sleep while Mr. Buddy is on. #4 When I turn off Mr. Buddy, I unscrew and remove the propane bottle. Some people don’t do this, but I take this precaution so I know no propane is leaking. While writing this post, I remembered another idea for getting/staying warm. I learned this one years ago from a New Englander in New Orleans. Drinking or eating something hot is a good way to warm up from the inside. However, when I’m cold first thing in the morning, I don’t necessarily want to crawl out of my warm bed to heat water for tea. For my birthday, my host family gave me a Stanley thermos. It keeps water hot for a long time. I used it while working the essay scoring job so I’d have hot water for my lunch. I’d heat the water in the morning, put it in the thermos, and the water would still be hot enough at lunchtime to prepare noodle soup (ramen noodles and the like). One day I didn’t use the water for lunch, and the next morning (24 hours later) when I opened the bottle, the water was still very warm. 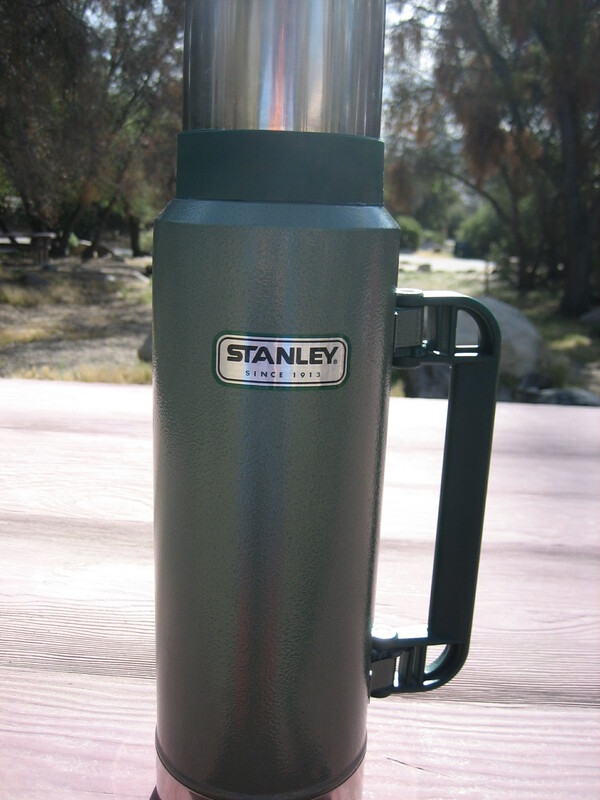 So this is my idea: Before I go to bed, I’ll boil water and put it in my Stanley bottle. I’ll put it next to my bed, along with my mug and a teabag. When I wake up in the morning, I’ll pour myself a cup of hot tea before I even get out of bed. Sounds lovely. I did not receive any compensation for the endorsements of the products in this post. I wrote this post after I already owned the products. I just like ’em, and I think my readers might like them too. If you click on either of the photos below, you can shop on Amazon through my affiliate link. If you do your normal Amazon shopping through my affiliate link, I receive a commission from your purchases at no cost to you!